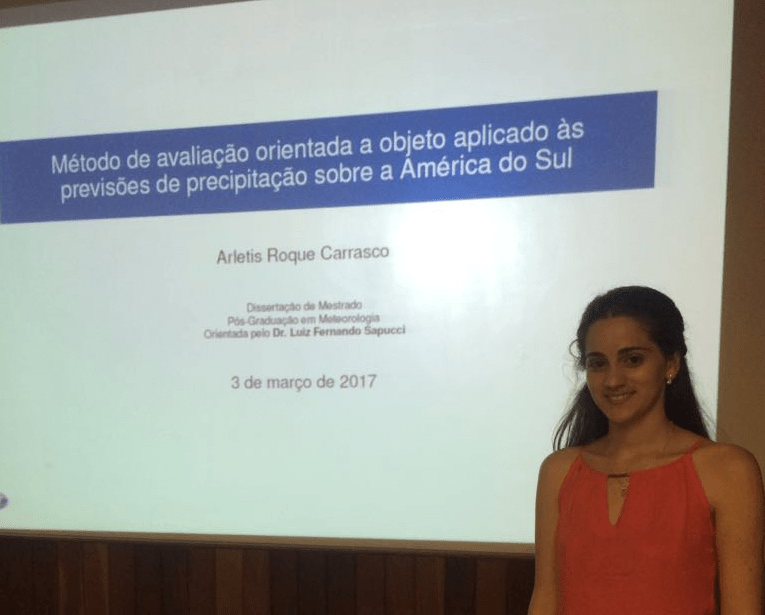 Arletis Roque, a master’s student at the National Institute for Space Research, presented his dissertation Method of Object-based evaluation applied to precipitation forecast over South America on March 3rd. The main objective of the study was to propose and apply a methodology for the evaluation of rainfall forecasts over South America based on the Method for Object-Based Diagnostic Evaluation (MODE) algorithm. The methodology was implemented within code of the Community System for the Evaluation of Numerical Models of Weather and Climate Prediction (SCANTEC), which is a statistical software that is developed (and frequently updated) at CPTEC/INPE. An application of the methodology using BRAMS model precipitation forecasts and the estimated precipitation data in the TRMM Multisatellite Precipitation Analysis product 3B42RT as reference values, demonstrated its potential to characterize the spatial patterns of precipitation forecasts provided by this center allowing fairer comparisons with other available products.